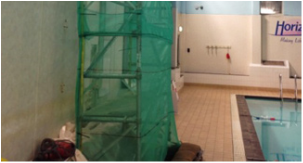 Total Constructive Solutions were initially asked to survey the concrete surrounds to columns on the internal pool area as there was evidence of external cracking. Because this is a busy public space, all work was undertaken between 9pm and 6am so not to disrupt swimming sessions. Our findings, once the investigation was complete, showed that the concrete covering to the steel was carbonated and the steel RSJ face was corroding. This led to cracking appearing on the concrete covering and in turn saw it debonding from the steel column. If left this would quickly become a safety issue to the public. We started the removal of the concrete casing to expose the web and back of the steel. An electric 100v descaling gun was then used to remove any rust and clean back to bright steel. 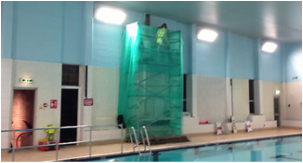 The same evening we were able to prime the steel and apply two coats of corrosion control paint from 3m. Once the coating was cured we then placed form work on either side of the columns and applied a repair mortar to match the existing column profile. We then applied two coats of anti-carbonation coating to complete the integrity of the column repair. This project required taking up existing screed and tiles from an access stair outside one of Portsmouth University’s main buildings. It was then replaced with Ronacrete 'Stone Carpet'. After being contacted by Eaton Aerospace in Fareham we were asked to investigate the delaminating of precast panels to the external walls on one of their main office blocks. 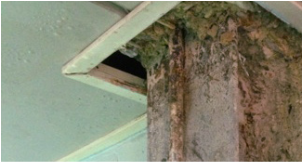 We undertook a survey to establish a number of defective areas of render caused by water to all four elevations of a building block within the QA Hospital complex. Car park asphalt surface was showing signs of wear. The residents association decided they would take up both asphalt and screed surfaces and replace like-for-like.